If people knew, they wouldn't be sharing it. A rare crossbred lion-tiger cub is only a few weeks old and he is already being carted around Russia for show. That's because he's a rare sight - there are only roughly 30 animals like him in the world. Tzar was born after a male lion named Cesar was bred with a tigress named Princess at a zoo in the Samara region of Russia. The zoo is feeding him goat milk and calling him Tzar. But the natural habitat of tigers is in Asia, while the natural habitat of lions is in Africa - so there is nothing natural about a "liger." Tzar's parents, if they were wild, wouldn't even live on the same continent. "Mating between lions and tigers would not happen in the wild," Susan Bass, director of public relations for Big Cat Rescue, told The Dodo. "Sadly, it does happen when captive big cats of different species are kept together because irresponsible breeders and exhibitors have figured out that people will pay to see a rare, unusual exotic cat." And because the crossbreed goes against nature, this cub is likely to face a rough future, even aside from being carted around by a traveling zoo for show. Tiger moms forced to carry the liger cubs often have life-threatening trouble giving birth because the size of the cub is an unnatural fit for their bodies. So it's no wonder that there are only roughly 30 animals like him in the world, though estimates vary. Not only that, ligers often suffer from birth defects and other health problems. Ligers, if they survive early cubhood, can grow up to be 900 pounds, almost twice as large as either of their parents. Because they get so large, their organs can't take it and their hearts can give out due to the sheer size of their bodies. "Breeding these cats is all about money," Bass said. "The welfare and health of the cubs doesn't enter the equation. 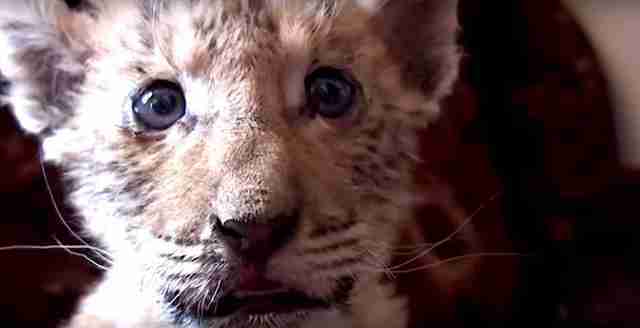 The recent birth of the liger cub at a zoo in Russia is a perfect example of that." Ligers aren't the only examples of big cats forced to breed unnaturally to make money for their owners. White tigers aren't a naturally occurring species either, but a result of inbreeding. Bass added that one way to stand up for tigers and lions who could be forced to breed against nature is to never pay to see or hold one of these cubs. At the very least, stop and think before declaring that the liger is "pretty much [your] favorite animal." To help big cats rescued from abuse and neglect, you can donate to Big Cat Rescue.